To use traditional media similar to layers in a digital drawing program. 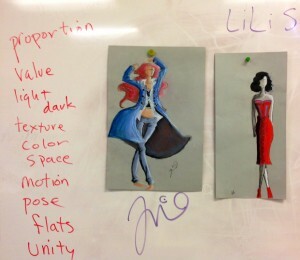 To create a system for building shape, silhouette, value, color, and edges effectively in a fashion drawing. To combine flats into cohesive fashion looks. 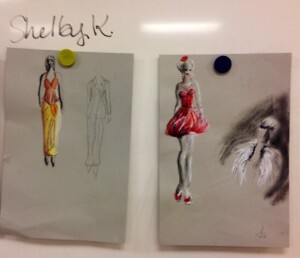 This was a pleasant set of tasks for the gifted students and more of a struggle for the more shy drawers in the group, however the results showed a full range of values and bolder colors than previous drawings. Students were also able to get different textures and pull accessories into the look. They added unity by tying color themes together.